The Great Horned Owl is a very aggressive nighttime hunter and strikes from above. This is why they are sometimes called “tigers of the night.” They use their strong talons to carry animals several times heavier than they are. Great Horned owls will also kill and eat rattlesnakes. What does the great horned owl eat? Great Horned Owls are strictly carnivores. They eat raccoons, squirrels, rodents, falcons and sometimes other owls. Great Horned owls also eat skunks which is why they will often smell like a skunk. They also will catch cats and dogs because they have no idea they are someone’s pet. They think it’s just another prey animal in the wild. 25 to 30 years in captivity. How many Great Horned owls can be born at a time? One to five eggs are laid but 2 are typical. Both the male and the female incubate the nest and the male hunts for food. Great Horned Owls are found from the Arctic to South America. They use their strong talons to carry animals several times heavier than they are. As with most birds of prey, the male Great Horned Owl is smaller than the female. He also has a much lower pitched call. Great Horned owls will also kill and eat rattlesnakes. 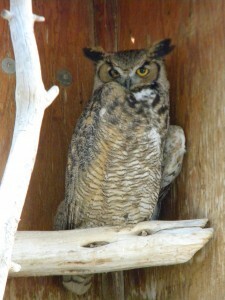 There are six Great Horned Owls at the Big Bear Alpine Zoo. Barbie – came to us in 1997 as an adult so we don’t know exactly how old she is. She came from a rehabilitator because she was found wrapped in barbed wire and her flight muscles were damaged. Since she could not fly, she could not be released. Boo – came in 2006 as a youngster and had a damaged right wing so he also could not be released. Jackie O – came in 2006. She had been orphaned and was found and raised by a falconer. The falconer gave her to a rehabilitator who passed Jackie-0 on to us as she was very imprinted and loved people. Our other three Great Horned Owls are working birds. They do on and offsite educational programs and are very comfortable in front of crowds. Cosmo – was brought to the zoo in 2002 because he had been hit by a car. Unfortunately his right wing had to be amputated and he could not be released. Cowboy – also came to us with a severely broken wing which had to be amputated. He got his name from the fact that he would ride his perching branches like he was riding a horse.